This moving biography begins with its subject riding on a horse-drawn sled through the frozen beauty of the Ottawa Valley, where his father was the pastor of a small Lutheran church who baptized him in the kitchen sink when his seven siblings were quarantined with measles. It ends with him dying of cancer at the age of 72, with a mixed-race couple whose marriage he had defiantly celebrated decades earlier standing by, the woman crying, "Oh, Father Richard!" "A priest," Graham Greene wrote, "presents even more difficulties to his biographer than a writer.… [W]hen a man prays he is quite alone. His biographer—except when controversy, persecution, sanctity or disgrace lend to the story a spurious drama—must write a life of his hero which excludes the hero’s chief activity." 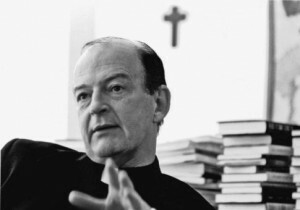 The life of Richard John Neuhaus was full of drama. Some of it was "spurious." Most of it, as Randy Boyagoda shows us in this wonderful book, was not. Neuhaus was one of the most important Roman Catholic clergymen in American history and perhaps our most considerable postwar religious journalist. He was also a minor political figure, first of the left, then of the right, and an ecumenist without whom the current political alliance between Catholics and Protestant evangelicals on issues such as abortion would be unthinkable. He enjoyed gossip and good jokes. He smoked cigars, drank whiskey, and turned the volume up when he played Bach on his hi-fi. He was arrested many times. Neuhaus was born in Pembroke, Ontario, in 1936. A handsome, intelligent boy, he quarreled with his father about racial issues while admiring him for having supported war against the Nazis, a position far from universal among the mostly German-speaking laborers to whom the elder Neuhaus ministered. What Neuhaus was later to call "the first theological crisis of my life" came at age seven, when an American preacher at a mission festival asked his audience to consider the fact that "in the last one minute, thirty-seven thousand lost souls have gone to eternal damnation." He spent the rest of the afternoon doing some rather severe arithmetic and wondering why no one else seemed concerned. A year spent at a boarding school in Nebraska was, as he later admitted, more or less wasted playing billiards. He dropped out and went to stay with relatives in Texas, where he ran his own gas station and spent his free time cruising in a Model A and blasting jackrabbits with a shotgun at the local country club. By 1953, he had accepted the fact that, despite being the youngest member of the Texas Chamber of Commerce, he was not destined for life in petroleum and cigarettes, and he enrolled at what was then Concordia College. (When an admissions officer pointed out that he had not supplied a high school transcript, Neuhaus replied, "I hope you will receive one soon.") Here he met Robert Louis Wilken, a lifelong friend with whom, after much thought and prayer, he decided to attend seminary after graduation. Under the influence of a brilliant teacher, Neuhaus’s Lutheranism became increasingly high church, and he reaffirmed what had been an instinctive commitment to celibacy. In 1961 he took up a pastoral assignment at St. John the Evangelist Church in Brooklyn, where he was to remain until 1977. Here he began in earnest what was to become a lifetime of political activism, traveling by bus with members of his congregation to the March on Washington, helping to found Clergy and Laymen Concerned About Vietnam, and getting booted out of the Democratic convention in Chicago. For a time, he had coffee regularly with his fellow demonstrator Joan Baez, whom he later took to calling an "old flame." A distinguished medical proponent of abortion on demand once assured me that no one should be forced to be born who was not guaranteed "the minimal requirements of a decent existence." When I pointed out that, by his criteria, most of the people I work with in Brooklyn should have been aborted in the womb, he responded with utmost sincerity. "But surely many, if not most, of the people who live in our horrible slums would, if they could be objective about it, agree with me that it would have been better for them not to have been born." He once sought election to Congress on an anti-Vietnam ticket. In a scheme that sounds iffy now but which was very much in keeping with the New York City politics of that era, a group of leftist noisemakers decided to hold a quasi-official contest to decide which of them would challenge the Democratic incumbent for the 14th Congressional District seat in Brooklyn. (Neuhaus was beaten in this "radical primary," and his opponent, despite endorsements from John Kenneth Galbraith and Dustin Hoffman, failed to secure the nomination.) He also took up literary journalism, defending draft dodgers in the pages of the Nation and trashing one of the first warts-and-all biographies of King in the New York Review of Books. Over the next two decades he moved rightward politically, befriending and collaborating with Peter Berger, Irving Kristol, Gertrude Himmelfarb, Norman Podhoretz, Midge Decter, Robert P. George, and Robert Bork among others—a who’s who of neoconservatism before the word became a synonym for hawkishness in the press. There were giants in the earth in those days. It is difficult to imagine any of my paleoconservative friends participating in a raid on the offices of Commentary, like the one to which This World, Neuhaus’s first magazine, was subjected in 1989. When his benefactors at the Rockford Institute decided that his criticisms of their other magazine, Chronicles, had become too pointed, Neuhaus suggested that he and his staff might part ways with the organization. He insisted that "this separation be entirely amicable." It was not to be. Three days before the meeting at which the board was set to discuss Nehaus’s proposal, a thuggish delegation led by Allan Carlson, then the president of Rockford, showed up at the offices of This World. Employees were told to shut down their computers and vacate the premises; locksmiths set to work immediately and two menacing goons stood by while severance checks were passed around. Neuhaus and his staff stepped out into the rain and retired for a long, liquid-heavy lunch. This incident has lived in infamy, or what passes for it in the smallish world of conservative opinion journalism, though no one who has read First Things, which Boyagoda rightly calls the single greatest achievement of Neuhaus’s public ministry, can quite regret it. Only a few months into the life of that magazine, but after years of considering the issue, weighing doctrinal questions against his profound attachment to Lutheran patrimony, Neuhaus was received into the Roman Catholic Church, and ordained a year later in 1991. Otherwise he was very much the same man: pious, affable, a bit vain (he kept framed photographs of his meetings with Nixon, Reagan, and other luminaries), almost freakishly energetic, demanding first a cigar (denied by his sister) and then a sweet Russian pudding only hours after being discharged from a hospital on Easter in 1993. Throughout his life, Neuhaus was committed to America as an idea and thought that the work of politics was to bring her present in line with the immutable principles of her founding. But he was a Christian first, one who acknowledged that while progress is certainly possible, our aspirations will never be fully realized this side of the grave. This language was spectacularly imprudent. But it was also axiomatic if one accepts Neuhaus’s premise that every single one of the 1.2 million fetuses aborted in this country each year is murdered. Nor was it entirely out of character for a man who, some 30 years earlier, had told Lyndon Johnson at a press conference that his scoffing at protestors could only "subvert the very democracy which loyal Americans seek to protect." Neuhaus had forgotten that for Christians democracy is at best a second-order good. (Evelyn Waugh put it well when he said that "there is no form of government ordained from God as being better than any other.") He had tried to look at his beloved America from the perspective of eternity. What he saw was not encouraging.